The Tribest Sousvant is a water oven similar to the Sous Vide Supreme, Mellow, Oliso Water Oven-Smart Hub, and Gourmia GSV550 Water Oven Cooker. "Tribestlife is here to provide you with quality products that will energize your life! ... We have carefully chosen all the products that we carry to make sure that you have the latest innovations and best products to help maintain a healthy lifestyle." They provide products for juicing, blending, sprouting, dehydrating, as well as soy milk and nut milk making. So, you can understand why a sous vide water oven, which provides an easy way to provide healthy food, fits right into their Tribestlife philosophy. We have had a chance to put the Tribest Sousvant through its paces and discover its strengths and weaknesses. We will share this information with you and hope that it will help you decide if it's the appropriate sous vide machine for your needs. This is a fairly lengthy article but you can jump to those sections you may be most interested in using the following Table of Contents. 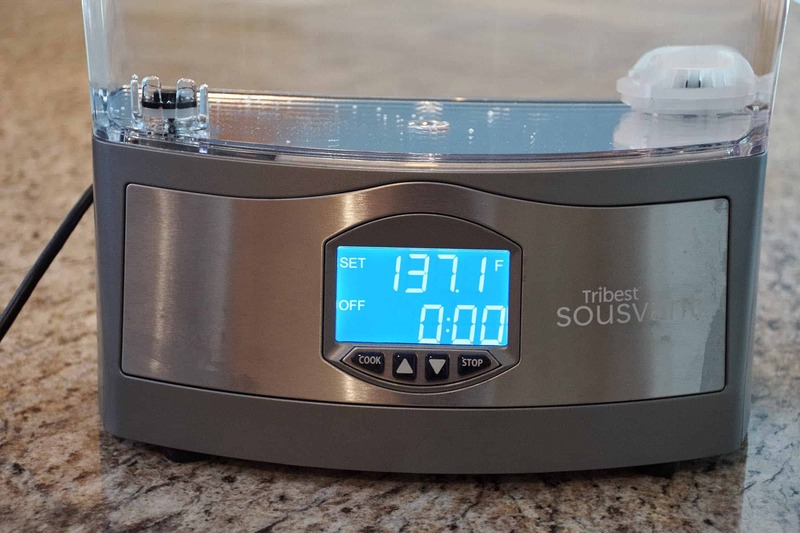 The Tribest Sousvant is an all-in-one designed unit with everything needed to turn out great sous vide meals. 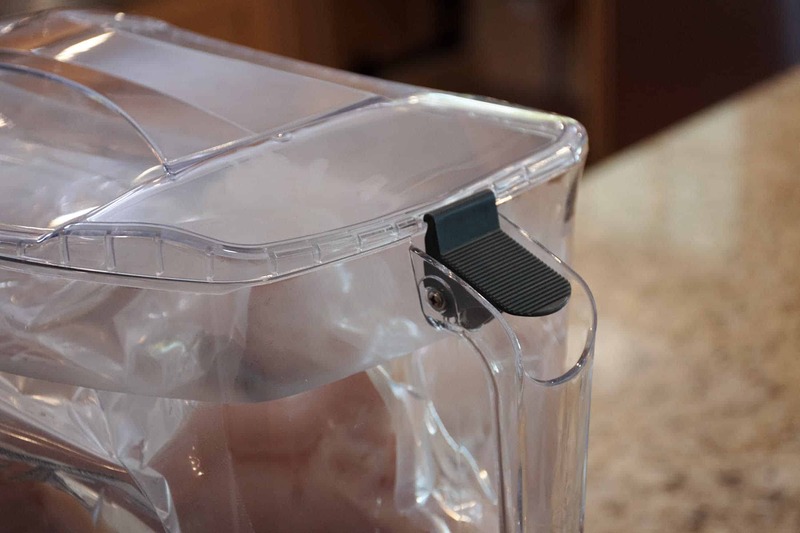 Since it is a water oven you simply need to remove the carafe from the unit and fill it with water. Replace it on the base, use the digital operator panel to set the desired cooking temperature, then press "Cook" to get it started. 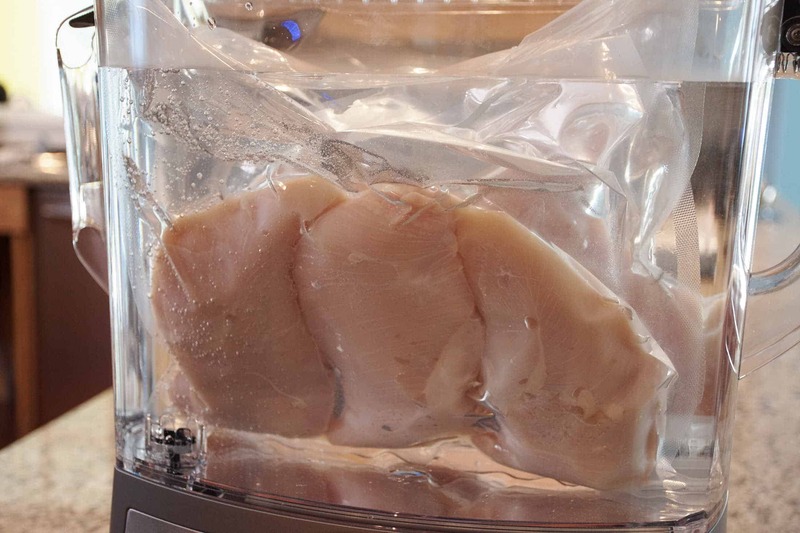 Next, put your sous vide bags into the carafe, snap on the lid, and you are on your way. It could not be much simpler. The next two sections will provide some details on the base unit and the carafe. The base unit of the Tribest Sousvant contains a circulating pump and a 1000W heating system. It has two "water connections" to the carafe that sits on top of it. 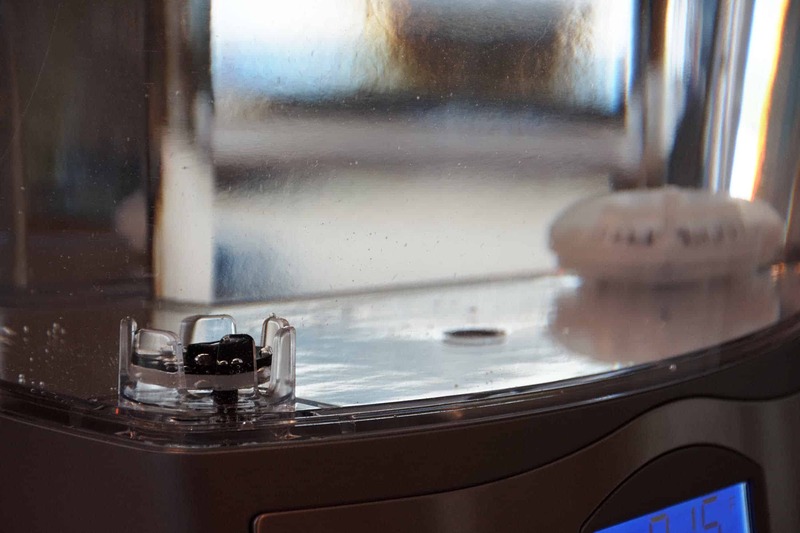 The base unit pulls water out of the carafe through one of the connections, heats it if necessary, and then pumps it back into the carafe through the second connection. On the front of the base unit is the Sousvant Operator Panel which is comprised of a digital screen and four pushbuttons (Cook; Temperature Up and Down; Stop). Warning: It is important to remember that when you complete a cook and removed the carafe from the base unit, there is still water remaining in the base unit itself. Therefore, if you are going to be moving the base unit, be careful to keep it level or the water can come pouring out on you and/or the floor. If you just completed a high temperature cook, that could be an unpleasant experience. The carafe is transparent which lets you monitor the cooking progress without having to open the unit. It is a very usable size with a capacity of 3 gallons (11.4 l) similar to the capacity of the Sous Vide Supreme and twice as large as the Mellow tank. 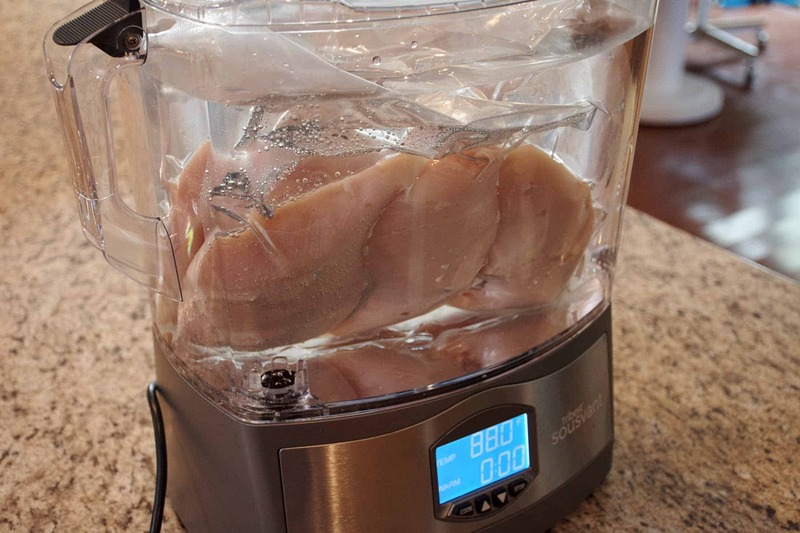 This carafe will allow you to cook the vast majority of cuts of meat and other proteins, without trimming or portioning them first. The carafe has a tight-fitting lid with latches which helps keep in heat and eliminates the evaporation of the water in the bath. The carafe is removable which makes it easy to fill, empty, and clean. And the two large handles on either side of the carafe make the handling of it quite easy, even when it's full. As mentioned above, the carafe has two "water connections" with the base unit. These allow water to flow out of the carafe, through the base unit to be heated, and then back into the carafe on the opposite corner. This cycling of water keeps the temperature of the water in the carafe quite consistent throughout. The connection where the water goes into the base unit has a filter on it which you can unscrew and clean if needed. The table below lists the basic specifications for the Sousvant SV-101 provided by the vendor. As mentioned above, the Tribest Sousvant SV-101 is a water oven and therefore its Basic Specifications are a bit different than those given for a "stick type" sous vide immersion circulator. There are some specifications that are worth highlighting, however. Typical of other water ovens, you will more than likely just leave the Sousvant on your countertop all the time. Depending on the size of your kitchen, and amount of counter space, this may or may not be an issue. Considering the size of the Sousvant carafe (3 gallons), the unit is actually pretty countertop efficient since it is only 7.5" deep 15.5" tall. This makes it easy to push the unit to the back wall when not in use, freeing up the counter space in front of it. This specification is one that often tends to be overlooked. However, it can be important on lengthy cooks at high temperatures when evaporation of water in the bath can cause a premature termination of the cook. Since the Sousvant does not have specific minimum and maximum indicators this parameter is a little hard to specify. The point is, however, that there is a very large spacing of at least 7", which gives the Sousvant by far the largest spacings of any sous vide machine tested. Moreover, it has a tight fitting lid which for all intents and purposes totally eliminates the loss of water due to evaporation, while aiding in keeping the water at the target temperature. Since the Sousvant SV-101 is comprised of two separate units, each needs to be considered from a cleaning perspective. The Sousvant has a removable carafe, which makes it quite easy to take it to the sink and give it a good cleaning. This is definitely an advantage over an immersion circulator which is sometimes difficult to keep clean. It is also easier than those water ovens which are one unit, and you can't really put them in the sink to clean them easily. But let's not forget that the water is also circulating through the base unit as well. There is no real way to easily clean the inside of the base unit. 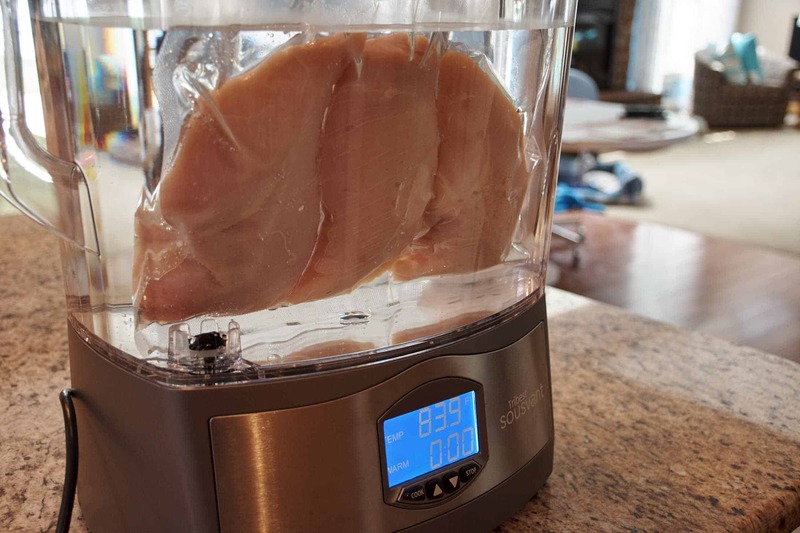 Tribest recommends that approximately every 100 hours of cooking time a decalcification cycle should be run on the Sousvant. This entails running a mixture of water and white vinegar through the Sousvant for approximately 15 minutes. A similar type exercise would be required if a bag leakage were to occur. 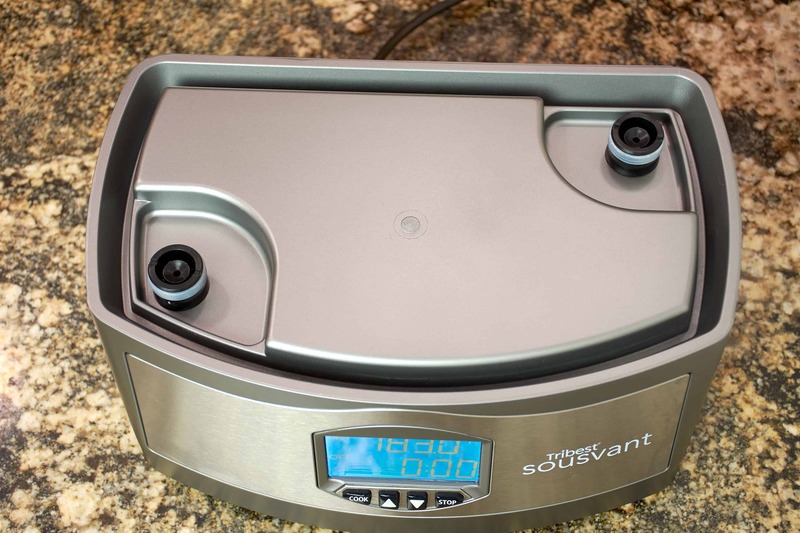 Although the Sousvant is priced similar to the other water ovens at around $300, it is significantly more expensive than immersion circulators which range from approximately $100 to $200. Of course, if you take the immersion circulator route, you typically will still want to purchase a water bath container and lid. But you can still get sous viding for less money than with the Sousvant. You just need to determine if the other features and benefits of the Tribest Sousvant SV-101 make it worth the additional investment. The table below lists the performance specifications for the Sousvant provided by the vendor. Please refer to this as necessary as I highlight some of the specifications. Unlike every other water oven, the Sousvant is the only one that actually circulates the water using a pump. And with a pump speed of approximately 12 L per minute, it is circulating more water than most of the immersion circulators. 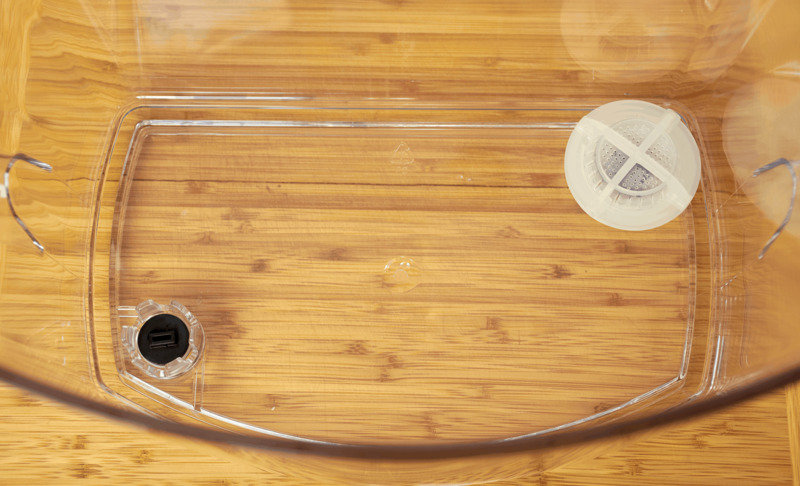 This water circulation helps ensure a consistent temperature throughout the water oven for even cooking. When talking with sous viders it's always interesting to hear their opinions regarding water ovens versus immersion circulators. I do not want to address that topic in this post, but there is one portion of that argument that is worth highlighting regarding the Sousvant. An undisputed advantage of most water ovens is that you can put liquids in them other than water. For example, I've seen them used to make soups and stocks, to keep cheese sauces warm and liquidy, to maintain the temperature of baked beans, chili, etc. Since the Tribest Sousvant SV-101 does have a circulation pump, it precludes these types of uses since the liquid is actually circulated through the heating unit in the base. It's important to keep in mind the Sousvant is missing one of the most useful advantages of the water oven, the ability to heat liquids other than water. I believe the 3 gallon (11.4 l) capacity of the carafe on the Sousvant is a great size for most sous viders. It's very similar in capacity to other water ovens and most of the water bath containers used with immersion circulators. But keep in mind, in the rare case that you do need a larger container, you don't have the option to go to a larger container like you do with an immersion circulator. The Sousvant SV-101 has a 1,000 Watt heater which puts it in the top tier of sous vide machines available. There are a few that have more power but most of the inexpensive ones are in the 800 Watt range. The table below summarizes the user interface for the Sousvant SV-101 provided by the vendor. Please refer to this as necessary as I highlight some of the specifications. The user interface for the Sousvant couldn't be any simpler, it is comprised of a large digital backlit display and four buttons. The digital display is user-friendly and foolproof. The "Up Arrow" and "Down Arrow" buttons are used to enter the desired cooking temperature. Once the temperature has been entered, the "Cook" button is pressed to start the cooking cycle. When the target temperature has been reached, the timer begins to count. In order to stop the cooking process, simply press the "Stop" button. That's all there is to it! It is also possible to adjust the backlighting level of the display to one that's most appropriate to the ambient lighting of your home kitchen. You can learn more about the Sous Vide Machine Benchmark and see how the Sousvant compares with other sous vide machines we have benchmarked. Below I highlight parameters in which the Sousvant was different than the majority of other sous vide machines. 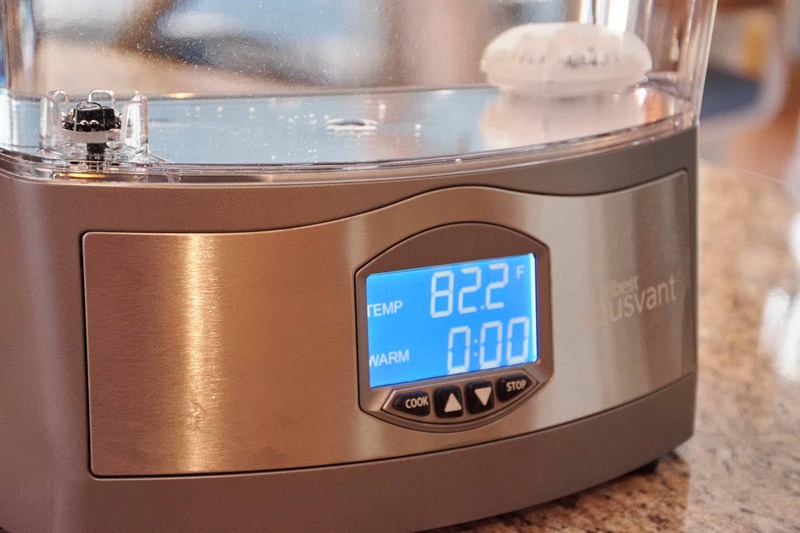 The Room Temp Start Time, Hot Tap Start Time, and Temp Rise Time parameters placed the Tribest Sousvant SV-101 among the faster sous vide machines, and quite a bit faster than the Sous Vide Supreme water oven. 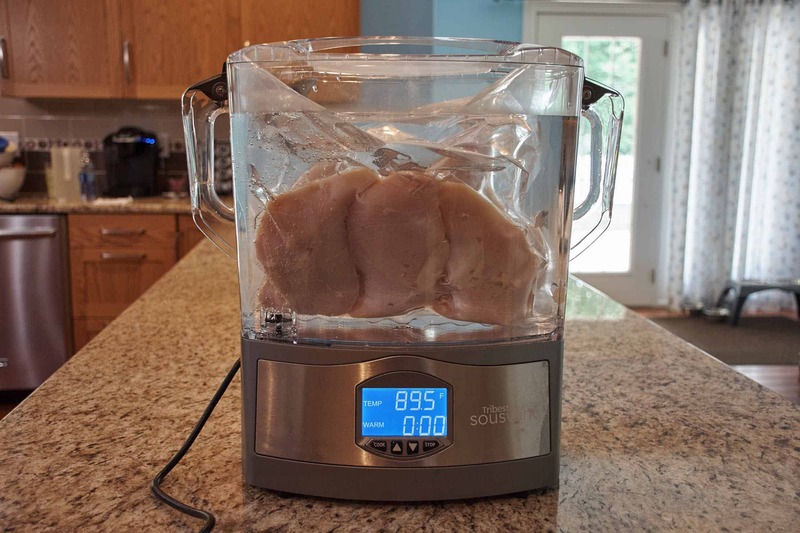 The Low Temp Variation and High Temp Variation of the Sousvant were similar to most immersion circulators and much better than the Sous Vide Supreme water oven. Also, when raising the water temperature the Sousvant SV-101 had very little overshoot, which it quickly corrected. 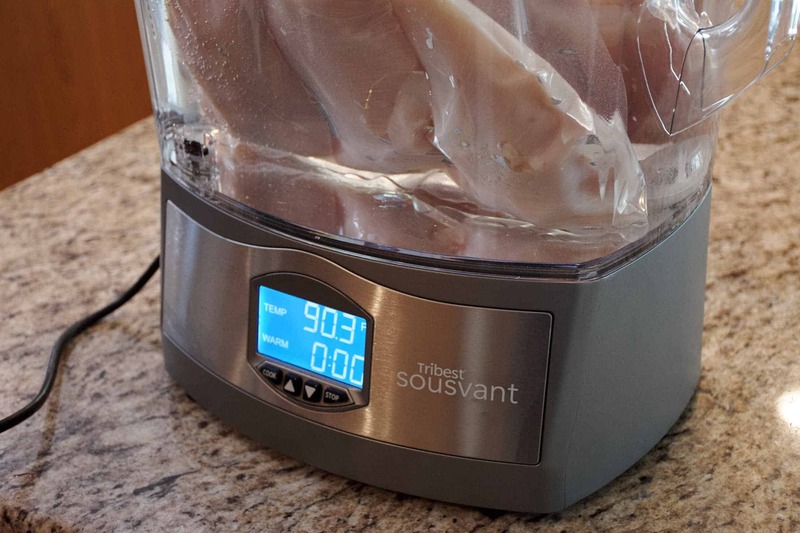 The Sousvant was the most power efficient sous vide machine we have tested. Although Tribest can be congratulated for this accomplishment, keep in mind that the differences in power are quite small, and that overall, sous vide cooking takes very little power. If you are interested, you can learn more about How Much Energy Does Sous Vide Use? Similar to the Mellow, the Tribest Sousvant SV-101 is among the loudest sous vide machines we've tested - this is in stark contrast to the Sous Vide Supreme water oven which is one of the quietest. The pump in the base unit is just very loud and runs all the time. If you scan the reviews of the Sousvant on Amazon, you will see that the noise level is by far the most frequent complaint. This noise may or may not be a deterrent to you depending on your proximity to the Tribest Sousvant SV-101 while it is operating. If you are at work or far from the kitchen the entire time, then you're golden; but if you are working in the same room where it is operating, like Jason, then it's a showstopper. The Sousvant is one of the simpler sous vide machines, but it does have a few interesting design features I highlight below. We often hear the phrase, "Less is More", which expresses the notion that simplicity and clarity lead to good design and that which is less complicated is often better understood and more appreciated. In my opinion, the design of the Tribest Sousvant SV-101 embodies this phrase. If you are a techno geek you may thoroughly enjoy researching the sous vide universe for the "perfect" sous vide setup. Which immersion circulator should I select? With Bluetooth? With WiFi? How much power? With manual controls? and on and on! 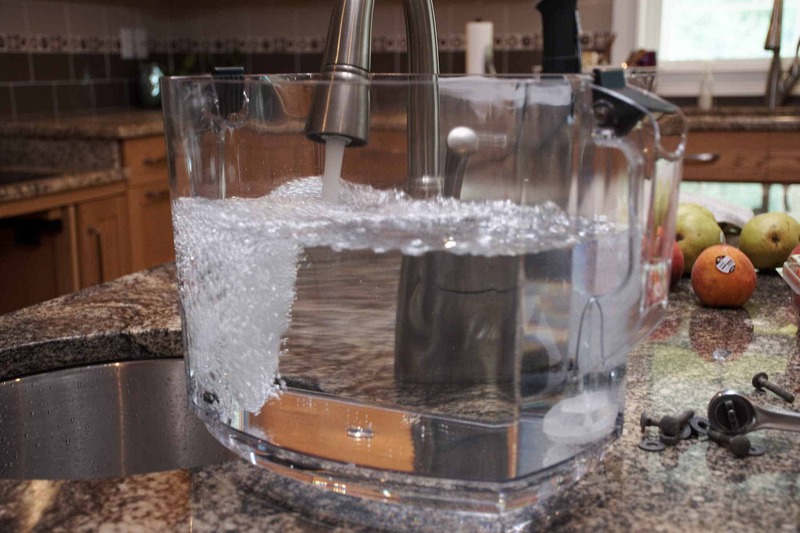 Then you can move on to selecting the best water bath container and lid combination. The fun never ends. But if you just love to cook, and you're anxious to try sous vide, then the Sousvant SV-101 may be the "perfect" sous vide machine for you. Its all-in-one design has everything you need wrapped up in one package. You just unbox the unit, fill the carafe with water, place it on the base, select your temperature using two arrow keys, add your sous vide bags to the carafe, snap on the lid, and push the Cook button; you are now an "official" sous vider! 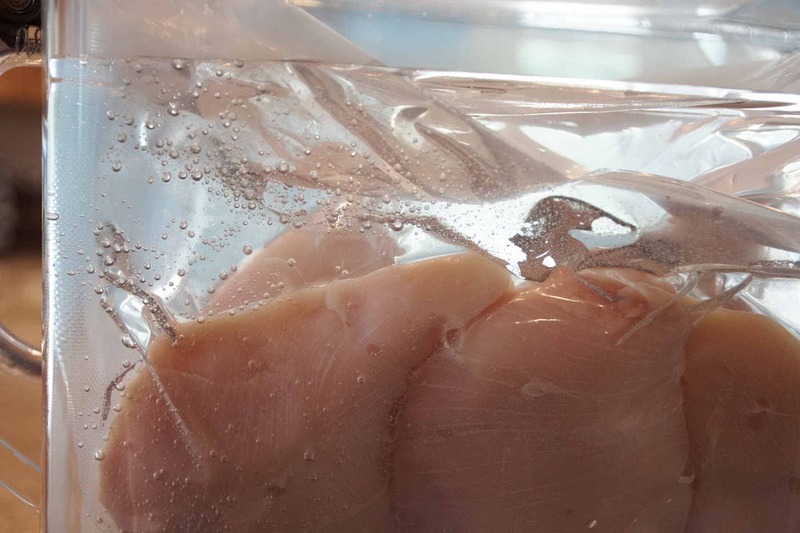 Transparent - This allows you to keep an eye on the food that's cooking without having to remove the lid. It is removable - This makes it much easier to fill, empty and clean the carafe. Tight-fitting lid - The lid fits tightly which keeps the heat in and minimizes evaporation. Large handles - The large handles on both sides of the carafe make it very easy to manipulate, even when full. Ample capacity - The 3 gallon capacity is large enough to handle the sous vide needs of the majority of families. The Tribest Sousvant does a better job than most sous vide machines in those cases where the power goes out temporarily during the cook. In the event of a power failure during cooking, the cook time will be reset to 00:00. The Sousvant will then respond in one of two ways once the power returns. In this case cooking will resume at the programmed SET temperature. Also,the COOK indicator will blink to indicate that the timer was reset by a power failure. In this case the Sousvant will display a FAIL 7 indication. I am not a huge proponent of water ovens, but I like this one more than most. Perhaps its greatest advantage is its pure simplicity. The all-in-one design provides everything a user needs to start sous viding. No need to put together a bunch of pieces and/or do some DIY modifications in order to get going. I also feel Tribest made some intelligent design decisions providing the unit with: ample capacity (3 gallons); plenty of power (1000W); temperature accuracy (0.1°F); and water circulation. The greatest disadvantage to the Sousvant is its cost ($300). This makes it more expensive than even a "high end" immersion circulator sous vide setup. Also, keep in mind that, unlike other water ovens, the Sousvant SV-101 can only use water in the bath. For many sous viders an immersion circulator would be a more cost effective, and in many cases a more useful, sous vide machine but if you want to get into sous vide cooking and are looking for a simple all-in-one type setup, the Sousvant water oven could be just the thing for you. If the Tribest Sousvant SV-101 sous vide machine sounds like something you would like, you can get it on Amazon. If you have experience with the Tribest Sousvant SV-101 sous vide machine, I would appreciate you sharing it in the comments below or our Facebook group. Thanks.